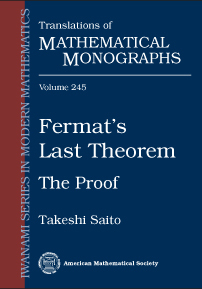 This is the second volume of the book on the proof of Fermat's Last Theorem by Wiles and Taylor (the first volume is published in the same series; see MMONO/243). Here the detail of the proof announced in the first volume is fully exposed. The book also includes basic materials and constructions in number theory and arithmetic geometry that are used in the proof. In the first volume the modularity lifting theorem on Galois representations has been reduced to properties of the deformation rings and the Hecke modules. The Hecke modules and the Selmer groups used to study deformation rings are constructed, and the required properties are established to complete the proof. The reader can learn basics on the integral models of modular curves and their reductions modulo \(p\) that lay the foundation of the construction of the Galois representations associated with modular forms. More background materials, including Galois cohomology, curves over integer rings, the Néron models of their Jacobians, etc., are also explained in the text and in the appendices. The book, together with the volume I, is very clear and thorough, and may be recommended to anyone interested in understanding one of the deepest results of the twentieth century in mathematics.